When I was a lad I was a devotee of the style of clothing known as Ivy League. 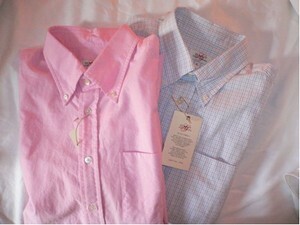 I liked Brooks Brothers, but when it came to button-down collar shirts I preferred those made by Gant. 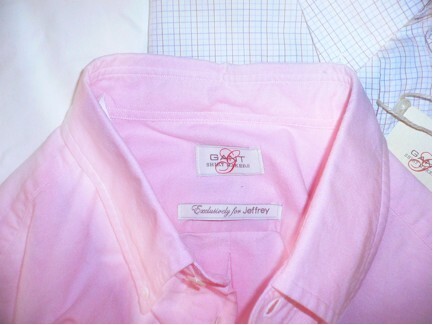 Gant was founded in New Haven in 1941 and used to manufacture shirts for Brooks Brothers and J.Press, during which time they became masters of the oxford cloth button-down. They had a breast pocket, unlike the Brooks shirt, which supposedly didn't because you were supposed to wear a vest or a jacket with it, and they had three collar buttons instead of two, and a handy locker loop in the back. Anti-preppies sometimes called these "fruit loops" or "fag tags," and they were sometimes attacked by vicious girls. The Gant shirt also had what I considered to be almost the perfect amount of collar roll; that is, when the collar was buttoned it didn't lay flat but arced out in an appealing way. There was also, briefly, a button-down brand called Wren which I considered to have perfect roll, but these were almost impossible to find and there are no traces of them on eBay. I also preferred Gant's colors to those of Brooks, and when it came to making Indian madras short-sleeved shirts, they had no rival. Unfortunately the Gant family sold the business in the late sixties and, for my money, the product went down not long after that. Yesterday I dropped into Jeffrey, the "meatpacking district" high-fashion emporium (449 West 14th Street) and there, next to the Thom Browne preppie waif shirts, was a rack of beautiful button-downs that looked gloriously familiar. They turned out to be Gant shirts, replicas of the classic sixties model, complete with three-button collars and locker loops and that lovely roll. I would have recognized that pink shirt anywhere. I bought a couple of them. A bit more expensive than in the old days, but kudos to Jeffrey. This is the perfect button-down, slimmer than Brooks or J.Press (which is an inch slimmer than Brooks). For some reason many "trad" guys like their shirts muu-muu-like in their expansiveness. These are slim and chic. Unfortunately Jeffrey didn't have this shirt in white, but they had some nice colors and patterns. And no external logos! Please, Jeffrey and Gant, whoever you are now, don't stop! Finally, somebody got it right. Again.